MailChimp is a web-based application that handles the three main tasks of email marketing: managing subscriber lists, building email campaigns, and reviewing campaign reports. Our MailChimp integration lets you see all your key data on a real-time dashboard without constantly having to log in to MailChimp. You can keep a close eye on how your email campaigns are performing and improve your email marketing strategy. Which metrics and visualizations are available for Mailchimp? Display stats like Opens, Unsubscribes, Open Rate and Clicks for your most recent Campaigns. Search for Mailchimp using the Search sources field. Alternatively, you can also scroll down the alphabetical list of integrations until you reach the Mailchimp integration. Click on the Mailchimp integration. Is this is your first Mailchimp widget? 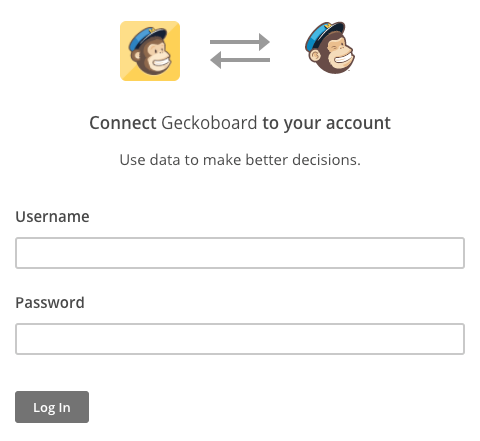 You'll need to connect your Mailchimp account to Geckoboard. If not, you can skip to our example Mailchimp widgets. When adding your first Mailchimp widget, you'll be asked to create a connection and authenticate your Mailchimp account so that we're able to collect your data and display it on the dashboard. You only need to create this connection once – we'll take care of the rest. Inside the Create a Connection panel, click on the Connect button. Inside the pop-up window, enter your MailChimp Username and Password. Click Log in to authorize your account. You're now ready to configure your first Mailchimp widget! Any Mailchimp widgets you create will pull in and display data from this Mailchimp account. You can connect as many Mailchimp accounts as you need, but you'll only need to authenticate once per account. 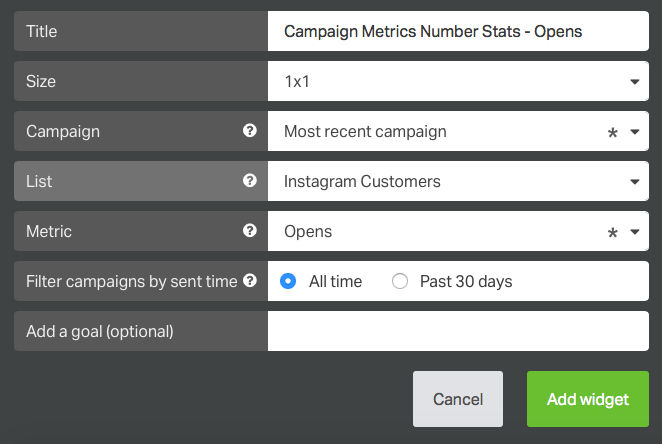 The Campaign Metrics List widget lets you track a wide range of metrics — Opens, Unsubscribes, Open Rate, Clicks, Successful Deliveries, among others — for your recent email campaigns. You can choose to display these metrics for all your mailing lists or for a specific one. 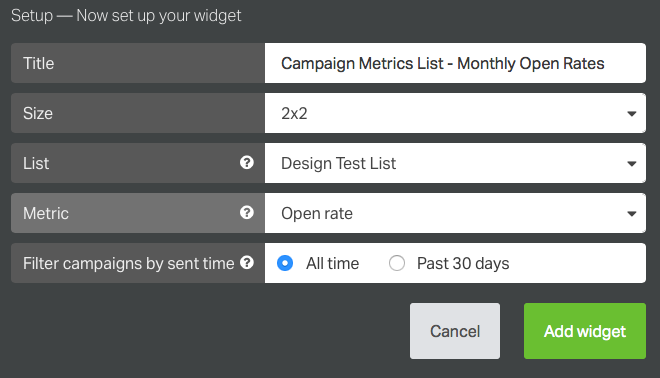 The widget offers a number of metrics to track for your email campaigns. Should you need help on what a particular metric means, you can refer to MailChimp's Campaign Statistics documentation. The List Subscribers Line Chart widget lets you track a wide range of metrics — Opens, Open Rate, Clicks, Unsubscribed, Last Opened, Abuse Reports, among others — for a specific campaign. Further, you can choose to track these metrics for all your mailing lists or for a specific one. You can optionally display a Goal for most of the metrics under this widget. The Bounced, Unsubscribed, Last Opened and Abuse Reports metrics don't provide this option though.